All CDs ordered here are autographed by Yevgeny Sudbin. 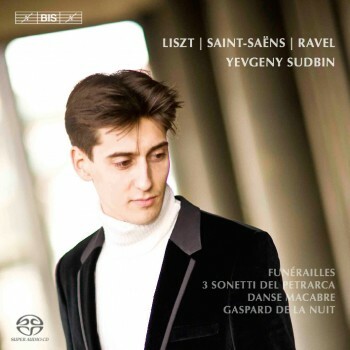 BIS is proud to present a new disc from star pianist Yevgeny Sudbin who here combines works by Liszt, Ravel and Saint-Saëns under the themes of Love, Delirium and Death. Funérailles is Liszt’s elegy for his Hungarian countrymen who died in the 1849 uprising against Habsburg Rule. Death also appears in Ravel’s depiction of a hanging – Le Gibet (The Gallows) from Gaspard de la Nuit – and closes the programme in Saint-Saëns’ Danse macabre. Love is present in the Petrarch Sonnets – originally song settings of poems in which Petrarch immortalises, the object of his unrequited passion – and Ravel’s Ondine – the tale of a water nymph tempting a mortal to join her in the depths of the lake. Delirium is present throughout the disc, especially during the nightmarish portrait of the goblin Scarbo. Yevgeny Sudbin has received considerable critical acclaim for his recordings on BIS. His disc of music by Scriabin was described in BBC Music Magazine as being ‘as terrifyingly changeable and emotionally all-engulfing as the music itself’.